VAT for Amazon Sellers – The TRUTH No One Wants to HEAR! Let’s talk about Value Added Tax (VAT) as it relates to selling on Amazon. Recently, there has been a storm forming around this subject, especially after the infamous Amazon invalid VAT number email that I covered in last week’s post. I have received tons of emails from my blog readers asking one simple question: DO I HAVE TO REGISTER FOR VAT? Since I am often responding to each individual with the same answers and information over and over again, I’ve decided to create a blog post that answers this question in as much detail as possible. I will cover as many scenarios as I can think of, so that after reading this post, it is 100% clear whether you, in your specific case, have to register for VAT to sell on Amazon or not. With that, let’s get started! VAT is something we all hear about and experience on a daily basis, whether it’s through business transactions, Amazon forums, retail shops, or invoices and receipts. 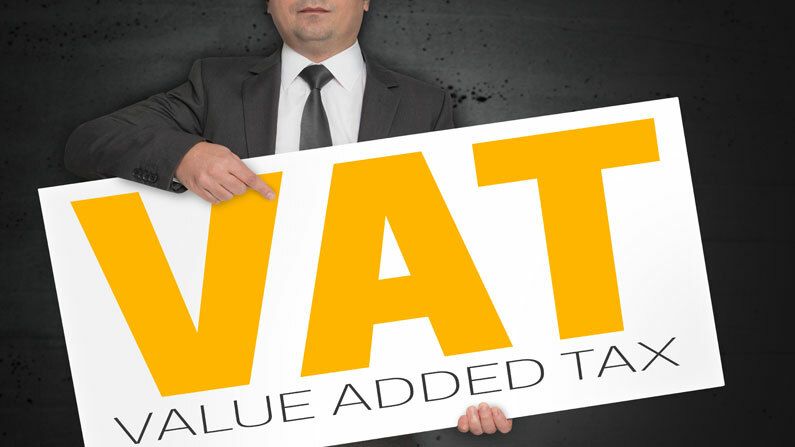 VAT (Value Added Tax), as the name suggests, is a consumption tax based on the value of goods and services. This tax is used in all European Union countries, as well as many other countries. In Canada, for example, it is called GST (Goods and Services Tax), but the principle remains the same. In the UK, the rate is set at 20%, which actually puts us amongst the countries with lowest VAT rate. In the past, it has been even lower; prior to 4th of January of 2011, the VAT rate in the UK was just 17.5%, and there was once a temporary period where VAT was only 15%. Basically, most everyday products that you see on Amazon or in your local Tesco will have the standard VAT rate of 20% applied to them. It is the rate you are most likely to encounter on a daily basis. You can get a more detailed overview of goods and services and their various VAT rates on this page. In each country, these categories of VAT rates for goods and services will vary. The information presented here only applies to the United Kingdom, so if you’re residing in another EU country, you will need to check your local information on this. VAT is charged at the moment of a sale/transaction, and the business or person who is VAT registered is responsible for filling out regular VAT returns (usually quarterly) to forward the VAT amount they have collected from customers to the HMRC. When you are VAT registered, you can claim back the VAT that you pay on your business expenses. So, in that VAT return, you will also provide details of all the VAT paid on business expenses—for example, VAT paid on goods purchases, online selling fees, and other business-related expenses—and DEDUCT that amount from the payable VAT. Let’s do a quick example to really make this crystal clear. Let’s say that, in a three-month period, you have sold goods worth £10k (incl. VAT). The amount of VAT you charged was £1.67k (20%), but you also paid £1k in VAT in that period through your normal business expenses. In that case, you would only send £0.67k to the HMRC, which is the difference between what you have charged and spent in VAT. This is obviously a simplified explanation. The VAT law and rules, especially in relation to international trade, are very complex. However, this is just to give you a basic understanding of how it fundamentally works for an average seller. The most important thing to remember is: You do not want to register for VAT when you’re just starting out IF you’re not obligated to register for it. We’ll cover how to know if you’re obligated to register for VAT later in this post. Just know that it does not make financial sense or benefit you to voluntarily register for VAT because you will always end up paying more in tax than a seller who is not VAT registered, if you sell the same item at the same price. As always, there are some rare exceptions to this. The majority of your sales will be B2B transactions. If you are selling the product to other VAT-registered businesses, then it might benefit you to register. Businesses don’t care about paying VAT because they know that they will deduct it from the payable amount anyway. Plus, businesses like to get a proper VAT invoice for their purchases. On Amazon, this is now very easy to do with the Amazon Business Services, which includes automated VAT invoicing solutions. More on this another time. You sell zero-rated or 5% VAT rated goods. It’s pretty simple; you will charge a small % of VAT on your end sales but will be able to claim back the full VAT paid on your business expenses. I would still recommend that you do the math to figure out exactly how beneficial it is in your particular situation, but if you sell 0% VAT rated goods, you definitely want to be VAT registered from day one, so you can claim back VAT on business expenses. As you won’t be charging your customers any VAT, the HMRC will actually be sending you payments for the VAT you have spent on business expenses. It’s basically free money. You plan on investing aggressive amounts of money into inventory, equipment, or plan to work with huge losses in the first year or two of trading. In this situation, you would be spending MORE in VAT than you earn, which creates the negative VAT balance. So again, the HMRC will pay you back the difference you have spent in VAT to what you have taken in sales. This situation will be very rare, though, and will be more applicable to bigger companies who usually come into the market very aggressively with offices, manufacturing plants, huge advertising budgets, etc. I won’t go into detail on each of these three scenarios as they are the exceptions and not the rule. That said, if you do fall under any of these three categories, I would recommend you consult an accountant who can assess your situation and do the correct calculations for you to help you decide whether it is worth registering for VAT from day one or not. There is also a FLAT VAT rate scheme available in the UK, which allows small businesses to pay a fixed amount of VAT to the HMRC to keep their accounting as simple as possible. For the sake of time and relevance, I won’t get into it in this post. We’re just going to cover the VAT information that will apply to the vast majority of sellers here. Just know that this scheme exists and might be worth looking into further if you’re UK-based. For Amazon sellers, I do not specifically recommend this flat VAT rate scheme because some of the Amazon VAT services may not be available to you if you are using this option. But again, please consult a qualified accountant on this topic. Ok, this is as far as I want to go into VAT basics. The topic is obviously huge, so if you want to dive deeper, you can find tons of reading material on the HMRC website or simply book a consultation with an accountant who can provide you with qualified advice. Please remember that I am not an accountant, so please do not ask me specific VAT/accounting questions as I can’t provide you with qualified information. Now, let’s take a closer look at how exactly VAT relates to Amazon sellers, and, most importantly, how you can figure out whether you need to register for VAT or not! I have already touched on this subject, but it bears repeating. When you’re just starting out and registering a Ltd. company or have Sole Trader status, you won’t be VAT registered by default. You can voluntarily register for VAT from day one IF you want, but most typically won’t and will only register for VAT when they reach a certain threshold of sales. This threshold will be different in each country, and it often changes from year to year. Right now, in the United Kingdom, for the year 2018, the threshold stands at £85,000 per last 12 months of trading. So, you have to make at least £85k in SALES over the last 12-month period before you’re obligated by law to register for VAT in the UK. Often people ask: what does this number include? Do I have to take off my Amazon fees or FBA fees? No, you don’t have to take anything off this number. This is purely your sales/turnover—the amount of money you’ve taken in for the last 12 months of trading. Keep in mind that this is NOT based on a calendar year! It is based on the last 12 months of sales on a rolling basis. It is advisable to register for VAT in advance, e.g., when you see that you will go over the threshold in the next month, that’s when you should register. Otherwise, you’re just making more accounting work for yourself later on because you’ll have to calculate VAT on sales that happened prior your registration date. My advice is to just keep it simple and register at least a few weeks ahead of time. Sometimes you will find that you balance right on the edge of the threshold. As we know by now, not being VAT registered is more beneficial, so you may want to lower your marketing activities at such a time to artificially lower your sales and stay below the threshold. That is only recommended if you know for sure that your sales won’t improve that much over time and won’t go over £100k or more in near future. If you discover that you have gone slightly over the VAT threshold in one month but know for sure that you will go back under the next month, you can ask for a temporary exemption from the VAT registering process. You can find more details on this on the HMRC website. And just like you have registered for VAT, you can also DEREGISTER from VAT if your sales fall below the threshold in the future. So, say you start selling a very hot product on Amazon and your sales go over the £85k threshold, but then, after two years, demand for the product drops and your sales are down to £60k per year. Then you can deregister from VAT and continue selling on Amazon as a non-VAT registered seller. Ok, so far, so good! Keep in mind that everything I have covered so far in this post can also be applied to any offline business too since the VAT basics are same for offline and online businesses. However, there are a few slight differences that online sellers, including Amazon sellers, need to face—so let’s get into it! Yes, there’s another VAT registration threshold, and it’s called the “Distance Selling EU VAT Threshold”. This particular threshold was introduced just a few years ago to help fight VAT evaders in the EU and basically put the appropriate VAT money in the pockets of the country that the item is sent to. So, for example, if you sell something to a person in Germany, the German VAT rate is applied to the sale and Germany receives that VAT payment from you. These VAT thresholds apply to any business selling to an EU country! It doesn’t matter where you’re located in the World—be it the UK, the US, China or Brazil—if and when you reach the specified threshold of each country, you must register for VAT in that country, start charging local VAT on sales to that country, do VAT returns, and pay the appropriate VAT to that country. Registering for VAT in a different country, usually in a different language, and completing VAT returns can be a very complex and time-consuming task. It’s not usually something you can do easily on your own. Yes, the UK distance-selling limit stands at £70k, and this will be applicable to sellers living outside the UK but who are targeting the UK marketplace and, specifically, Amazon.co.uk. Once your sales reach £70k in a calendar year in the UK, you are obligated by law to register for VAT in the UK. This is an important distinction. Unlike the normal VAT registration rules that we have already covered, these distance-selling thresholds are calculated per CALENDAR YEAR—not the last 12 months of trading. This makes the process much easier for you as you can do the calculations based on the current year instead of the last 12-month period. Now, this VAT registration threshold kicks in when your sales to a specific country reach the limit set by that country, but when goods are NOT stored in that country. So, this applies when you store goods in your home country and send orders out internationally from your base location via regular post and courier services. This is one of the biggest misunderstandings when it comes to VAT and selling on Amazon. Goods location can and will trigger a legal VAT registration requirement. Many people are not aware of this because this EU law is just a few years old, but it doesn’t change the fact that it is currently effective and being enforced. Even Amazon has taken action to bring sellers in line with this legal requirement by asking for VAT numbers based on this factor alone. You must register for VAT in each country where your goods are stored, except your local/home country! And there are no thresholds! It starts from day one, so even if you send just 10 items to another country and sell them from there, you need to register for VAT in that country. Even more, you don’t even have to sell to that specific country! The location of the goods alone triggers this VAT registration law. So, for example, you may not sell your goods in Poland but since Amazon has a European warehouse in Poland, you will have to register for VAT in Poland too. This is why I strongly recommend you reconsider using the Pan-European Amazon fulfilment program. It will trigger your VAT registration requirements in multiple countries because your goods will be moved across Europe. Obviously, it’s best to register for VAT BEFORE you send any goods to that country and start selling, just to keep your books clean and Amazon happy. The only country this law does not apply to is your home country, which is where your business is registered. You can keep stock there without needing to register for VAT until you reach the VAT registration threshold. Ok, with basic VAT information, thresholds, distance-selling and the goods location rules covered, it’s time to take a look at some real-life scenarios to help you better understand the whole VAT issue and determine with certainty whether or not you need to register for VAT! Your turnover is below the UK VAT registration threshold, you store goods only in the UK, so you don’t have to register for VAT. As you have reached £90k in sales for the last 12 months of trading, you do have to register for VAT in the UK. As you’re storing goods in Germany and Poland, you have to register for VAT in Germany and Poland. You don’t have to register for VAT in the UK as your sales are just £50k in the last 12 months. You have to register for VAT in all three countries; in Germany and Poland because you’re storing your goods there and the UK because you have reached the VAT registration sales threshold. You have to register for VAT in Greece as you have sold £50k worth of goods to that country. This is above the Distance Selling EU VAT registration threshold for Greece, which stands at €35k. However, you don’t have to register for VAT in the UK yet since you have not reached the UK’s VAT registration threshold of £85k per last 12 months. You have to register for VAT in Italy from day one because you’re storing goods there in Amazon’s warehouse. You’re not obligated to register for VAT in the UK, though, as you have not reached the UK VAT threshold. These are the most typical scenarios a UK-based seller will face. Now, let’s take a look at what happens when someone from outside the UK but who is living in the EU sells on Amazon. Your stock is held with you in Slovakia and you haven’t reached the local VAT registration threshold, which currently stands at 49,790 EUR (so almost €50k). You have to register for VAT in Slovakia as you have reached the local VAT registration threshold, which stands at 49,790 EUR. You have to register for VAT in Slovakia since you have reached local VAT threshold. PLUS, you have to register for VAT in the UK as you have reached the Distance Selling EU VAT registration threshold, which stands at £70k per calendar year. You have to register for VAT from day one when your stock arrives in the UK, no matter how much you sell. You will have to register for VAT in all three countries: your home country, Slovakia (as you have reached local VAT registration threshold), United Kingdom (as your goods are stored there), and Portugal (as you have reached the Distance Selling EU VAT registration threshold to Portugal, which currently stands at 35,000 EUR). Ok, lastly, what about people who are based outside the EU? Sellers from the US, China and other countries around the world? The same rules of distance-selling thresholds and goods placement country apply to them! If you reach the distance sales threshold to specific countries, you have to register for VAT there. If you store goods in an EU country, you have to register for VAT there. You are storing goods in your home country and you’re not reaching the distance selling EU VAT registration thresholds, so you don’t have to register for VAT. As you’re storing goods in the UK, you have to register for VAT in the UK from day one. You have to register for VAT when you go above the £70k threshold for distance selling to the UK, even though you still store your goods in the US. You have to register for VAT in the UK (goods location) and in Spain too since distance sales to Spain exceed the €35k threshold. I really, really hope these examples will help clear this issue up for once and for all. And I hope it makes it easier to figure out how this whole VAT thing works and whether you need to register for VAT or not. These are the most typical situations I could come up with, but this is not a full and exclusive list! Please let me know in the comments block below the post if there is a scenario I haven’t covered so I can add it to the list. So that was it! A detailed overview of VAT registration for Amazon sellers. I have tried to include as much information as possible without being too specific or providing contradicting guidance. I will repeat myself once again and remind you that I’m not a qualified accountant and I can’t help you with specific VAT calculation questions or anything like that. You need to consult with a professional accountant to get qualified advice. As Amazon sellers, we all wish that these laws, rules and regulations were never invented. We don’t have large budgets for accountants, tax lawyers and all the other resources that large companies have. It can get frustrating; trust me, I know the feeling because I’m an Amazon seller myself and I’ve had to figure it all out myself. A few years ago, it was all total nightmare to navigate because there was no clear guidance or any of the tools and services that are available today. Amazon does understand the problem this creates for small sellers, hence all the VAT tools and services they have recently introduced on the platform. No other third-party marketplace (eBay, Etsy, etc.) has done anything like this, so we should be thankful that they are at least trying to make it easier for us. We should also be thankful for all the extra sales opportunities Amazon’s expansion into other countries brings us! I can’t really complain about the VAT issues—which is nothing to do with Amazon itself—when we get the opportunity to sell in almost every major country in the world, store goods at Amazon’s warehouse, and make money without lifting a finger. So please, as you dive into figuring out your VAT situation, always keep the positives in mind, like the opportunity for international trade and what it can do for your business. These are opportunities that, just a generation ago, were inconceivable for a small business or individual. There are people who always complain about something. I ignore such people. Don’t waste your time and energy on negativity—look for solutions and be thankful for the opportunity! I’m sure I will come back to the whole VAT issue very soon because there are some things I want to cover separately, like the VAT registration process itself, Amazon VAT services, etc. If you have any suggestions for what VAT topics I should cover in future blog posts, please leave them in the comments section below. As of now, Amazon simply deducts taxes from our sales (they are rather small i agree). As your blog suggests, we ought to register for UK and DE VAT and deal with paying taxes to the said countries for monthly/quaterly/early income? What we struggle with, is the US vat (or gst). It being a 3rd country, should we carry on and let Amazon deduct the taxes themselves and don`t worry about it, or should we get into the hell of registering dozens of VATs for each state that our products land in ? Yes, you have to register for VAT in the UK and Germany, no question about that. And do VAT returns etc. In the US, Amazon is charging Sales Tax on behalf of you in a number of States. For all other States – yes, you are liable to register for a Sales Tax number, charge it, do tax returns etc. It’s a very complex issue and you will find lots of discussions about this online, via forums/Reddit etc. Thanks so much for this site – have previously searched without success for information on Amazon VAT. Question 1 I am VAT registered so pay no VAT on fees. When completing my VAT return do I have to declare the fees in box2 as a purchase of service from EC? Question 2 Is VAT charged on Amazon ‘other’ eg. postage charged to customer. I personally HATE accounting stuff and have outsourced it all basically from the day when I started selling online almost 15 years ago. I know the basics, I know how VAT works etc. (hence this post) but I don’t know the small details, forms etc., as I don’t work with them on a daily basis. Thank you for this post is really helpful. I’m a sole proprietor registered in the UK for 5 years. I’m not VAT registered yet. As a sole proprietor, I never needed a VAT since mostly I did create Invoices as a consulter for part-time tasks and the amount never surpassed the minimum threshold. I just began selling on Amazon EU markets and probably I will not reach this year the minimum threshold either in the UK neither in the other EU countries. My product is stocked in the UK. I’m not registered on the Paneuropean program. I requested the Amazon customer service that they assured me that the program is not active to avoid the VAT nightmare that that will create. Now in this scenario, a German customer asks me for an Invoice. Could you please let me know if I do comply if I send in an invoice without a VAT number and with my UTC number on it? Yes, you can still provide invoices to customers if you’re not VAT registered, that’s perfectly fine. The invoice simply won’t have any information/data on VAT as you’re not charging it. I had no idea how I could get this answer. I really appreciate it. Brilliant post. Written in plain English. Thank you!!! If you do not mind, can you look at our case and answer some questions? 1) Do thresholds apply to us? If yes, do we include Tax/Vat in our sales price only once we hit thresholds and are collecting for a government? 2)We have a VAT in the UK – should we cancel it as we have not launched yet? Note – for a little more background: Our freight forwarder has their own postal service, that will do a direct injection of the packages to the local post or courier in the destination country. Our freight forwarders also own/manage the warehouse in China. 2) Not sure on this one, you will need to consult an accountant. I’m not really experienced in such complex dropshipping style schemes. I have a question regarding thresholds. Would the VAT from 80k be paid to Poland or UK? Im unsure if the stock held in poland is crossing the Threshold limit for UK and should be paid there under my current UK VAT registration. If VAT is paid to Poland, Technically unfair trading would apply here. A poland residant can sell goods to the UK opperating above the threshold and would be paying a lower VAT rate at 20%. Your help here would be much appreciated. With such complex questions, you really need to seek an accountant’s help… I’m sorry but I’m not an accountant. But I know for sure that VAT is paid based on the goods location – so if the item is stored in Poland and is shipped out, you would apply the Polish VAT and that VAT would go to Poland as item’s location is Poland. Firstly a great blog you have here, I have learned alot so far. Being from the UK, I am looking to pursue a side hustle as a FBA seller. You mention that if my sales is below £85k, I don’t have to register for VAT. No, that is not true – you don’t have to be VAT registered to import products from China. Use reputable freight forwarder such as Woodland Global and you will be fine. Thank you for the valuable information here. It was pretty straight forward. When you say “seller’s location” I’m guessing you actually mean where the seller is physically based. – But what if for example the seller is French, located in the US and selling in the EU. What would be the VAT situation granted that the stock could be in the US or France for example? – Also, isn’t the “seller’s location” more related to where the account is based/ was created from? (.com/.fr./.uk)? Thank you very much, and keep up the good work there. Sellers location basically means where the Ltd. or Sole Trader status is registered (location for the business). In your example, if the stock is held only in the US and France, you would need to register for VAT in France. And in other EU countries IF you reach distance selling thresholds. What if the seller is located in the EU like Ireland but dropshipping from china to the UK directly to the buyer? Is the seller regarded as an importer? That’s a good question but I don’t really know how this all works with drop shipping (have never been a huge fan of that concept so haven’t really researched it that much). Great article and thank you for the invaluable advice. I am setting up an Amazon FBA business trading via a UK Ltd company where I will be the sole director and shareholder. I will only be selling in the UK and the stock will also be held only in the UK, so no distance selling involved. However, I will be living in Spain and be a Spanish personal tax resident. Any profit the company makes will be disbursed to me as a salary so there will be limited company tax to pay in the UK. Will the company retain the £85,000 VAT limit or would the company be subject to a lower VAT limit? I was not sure when you say “Seller Location” whether this meant the location of the business entity or the location of the director/shareholder? Once again many thanks for your time. No, it doesn’t matter where you live – it’s the company location what matters. So in your case, you will still have the £85k VAT registration threshold if you keep stock in the UK. first of all a big compliment, great article. Alright, here my story. I am native German but tax resident in Italy. totally unregistered in Germany since years. Now my question. Why do you want to form an Ltd. company in the UK in the first place? If you plan on selling in Germany AND you’re originally from Germany, why not simply set-up company in Germany and get VAT number there? I am a UK sole trader who is not VAT registered. My stock is held in the UK and my Amazon UK sales are under the rolling 12 month £85,000 limit so do not intend to register for VAT. I am also based in the UK. I am considering selling in the US on Amazon.com via FBA with stock held in the US. I will be registered on Amazon.com under the same sole trader name and wondered if my USD gross sales figure, once converted to GBP, would be added to my UK sales when considering the £85,000 VAT limit? Or, will I merely be liable for US sales and income tax which will not effect my UK VAT limit? I have also considered setting up an entirely separate business entity to use for Amazon.com so that the two sales channels were kept at arms length. Thanks for your comment, it’s a good question! I’m a new Amazon seller in UK, about to sell under my non-VAT registered UK Ltd company. I’m currently waiting for a shipment of products from China for which I assume I’ll pay 20% VAT + duties on the cargo and shipping cost when it arrives at customs (through my shipping forwarder). When I come to sell on Amazon, will I then need to pay 20% VAT of sales every quarter to HMRC? If so, I’m effectively paying VAT twice on the products I’m selling. For that reason I assumed it would be better to register for VAT to avoid being charged twice, to offset the VAT paid on importing the products against the VAT I should pay for selling them. From reading your article though it sounds like I’m wrong on this, so a little confused here. No, you won’t charge VAT on your sales because you’re NOT VAT registered. You only start charging VAT when you become VAT registered. But yes, you will pay VAT at the importing stage, on goods sourcing value. Thanks for the article Andrew – really useful! When I look at my ‘Payments’ reports on Seller Central, and do a monthly report in ‘Date Range Reports’, it shows total sales exclusive of VAT. It doesn’t state that, but I’ve compared it to the VAT detail reports, and it definitely is showing the exclusive amount. My question is, does Amazon transfer to me the VAT inclusive amount or exclusive amount? Amazon transfers VAT inclusive amount to you on sales where VAT was charged. There will be sales where no VAT is charged though like to VAT registered businesses outside the UK. But in general, Amazon does not do anything with VAT charged on sales and transfer it all to you. Various reports throughout Amazon show amounts ex-VAT, that’s true. You need to pay attention to the details there. Thank you for such an insightful and helpful article – really appreciate the time and effort you took to write it! We are a UK VAT registered business based in the UK and below other 3rd party EU member state VAT thresholds – just to set the scene. My question is in relation to VAT declared to HMRC on Amazon UK/DE/IT/ES/FR sales. For an example, if we sell £1000 worth of goods on any of the Amazon EU marketplaces, then Amazon takes their seller fee’s, fba fee’s etc and the income for our business comes to £700. We are then paid £700 from Amazon for our product sales. Do we declare £140 VAT (20% of £700) or do we declare £166.67 (20% of £1000)? I have not found any material online to aid with this – and I cannot find VAT invoices for Amazons fee’s either so I am stuck as to what way to go with this. In my eyes, technically we are invoicing Amazon for £700 for the goods? Please let me know your thoughts – any pointers are very much so appreciated. Have you enrolled into VAT calculation service with Amazon? It seems you haven’t! Because when you enrol, Amazon provides very clear VAT invoices for all the services (seller, FBA, marketing) they have provided at the beginning of each month (for the previous month). They also provide a separate invoice for global listings – these would be the items Amazon buys from you and then sells to customers in Europe. we’re a UK based seller with FBA stock in Germany. We have a UK and DE VAT number. The issue we’re having is that Amazon enforces DESTINATION VAT over ORIGIN VAT methodology in their VAT Calculation service. Since we added our German VAT number, ALL your sales to that Germany, regardless of whether they are shipped from our UK warehouse (FBM), or from an Amazon fulfillment center in Germany (FBA) are automatically taxed at the German VAT rate. This warning may be something to include in your article, or to further investigate. Thanks for your comment and thanks for letting me know about this. I don’t use FBM so wasn’t aware of this. Thanks for this very detailed article. I am in a situation a bit specific and I do not see mine on the list, so I allow myself to ask it. Selling on: Amazon UK, more than 100k of sales a year. Basically, I am a dropshipper. So, when a buyer from amazon UK buy from me, I buy from someone in Hong Kong of China, who ship to my buyer directly. I think that, what the company does, it that they send the goods to another company in the UK and then, they send it to the customer. But basicelly, when purchased by the customer, the goods are in Hong Kong or china. What is the VAT implication of this, when it comes to me ? Do I need VAT registration in the UK ? You need to register for VAT in the UK as your distance sales to the UK are above the threshold which is £70 000 per year. You’re the seller, you’re the company who makes these sales in the UK, so you’re liable for VAT. I’m not an accountant though but that’s how I see it. If you use Pan EU program, your stock is distributed to multiple countries in Europe so you will have to register for VAT in every country your stock is held in, including the UK. There are NO thresholds for it! Even if you store just a few units of the product in the UK, you have to register for VAT. Thanks for the great article. We are a US-based company, Stocked our products in AMZ UK, selling to customers in UK, FR, DE, IT and ES. We need your feedback to decide the scope for annual VAT filing/returns. 1. Do we need to include the sales from other EU countries during the UK VAT filing or it should be just the sales to UK customers only since we didn’t cross the distance sale thresholds in other EU countries. 2. Do we need to do the UK VAT filing though we did not cross the UK sale threshold limit of 70k pounds? Or is it required to do the annual VAT filing even if we sell 100 products that year since we stocked/VAT registered in the UK? Thanks for stopping by. You will need to ask these questions your accountant/person who will be doing your VAT returns as the whole VAT thing in EU is much more complex than most people think. Especially if you are based outside the EU and deal with multiple EU countries. But the answer to your second question is 100% YES – you need to do VAT returns in the UK even if you do just one sale. And usually these are quarterly returns, not yearly. Thanks Andrew for the updates. Turnover : UK 50 thousands, Germany 35 thousands, France 30 thousands. Yes, you do have to register for VAT in the UK in your situation, as far as I understand it. Because ALL of the sales count towards your company’s turnover and as it exceeds the threshold, you do have to register for VAT in the UK. You should, of course, consult an accountant but that’s how I see it. Most useful article about Amazon VAT, thanks a lot! 1. Could we do DEREGISTER for the distance selling EU VAT? 2. As distance selling EU VAT is calculate per calendar year, is it from Jan to Dec? 1. Yes, you can. Essentially it’s same VAT registration as you would store goods in that country so the registration and de-registration procedure is exactly same. Yes, if you’re VAT registered, you will now charge VAT on sales. Whatever you increase your prices accordingly OR just work the new cost into existing prices, is totally up to you. I need to register for VAT in Germany and France, due to my stock being held there (FBA). I have spoken to a company who have quoted £600 set up then £140 a month to file! Bit of a kick in the teeth. Do you have any recommendations or advice of how to get this done cheaper? I don’t want to do it myself. They also said that I would need to file returns going back to the first date that I stocked in Amazon Germany/France. Yes, that is correct – you will need to file returns for previous periods. for a special promotion. If you sell a decent amount on Amazon already, contact Amazon support and ask them whatever you qualify for this promotion too as I know it has been extended into 2019 too. I haven’t started selling on Amazon.de yet. I will wait for my VAT number and then do it. THANK YOU VERY MUCH FOR THE HELPFUL ARTICLE. 1. income tax or corporation tax if registered as a company. 2. VAT – if above £85k in sales(Is the £85k only the profit i make?) in the last 12 months of trading. Is that all or am i missing something else? Please HELP Andrew. Again thank you very much for the beautiful information. Yes, basically it is corporate tax and VAT. But VAT only when you register for VAT. £85k is the threshold for turnover, not profits. And it works on a rolling 12 month period, not calendar years. So, basically, when at any given point for the last 12 months your turnover exceeds £85k, you’re required by law to register for VAT. Thank you so much for your post. As always, amazing summary and lots of useful information. I have a question. I suppose you are already VAT registered so could you tell me how does it work with import VAT? Do you still have to pay it when importing goods into the UK? I have a LTD registered in the UK, but I am not VAT registered yet and I am trying to calculate what the total product cost will be after having to register for VAT. Could you please tell me what elements would still remain after registering for VAT? I recommend you read more about how VAT works or consult a tax advisor as in the beginning it is hard to understand the concept. The simple version is – you pay the government the DIFFERENCE in VAT you charge on sales and what you pay out to others. For example, if in a month you pay £1000 in VAT in Amazon fees, VAT on imports etc. and CHARGE £2000 in VAT on end sales, you would pay the government the difference, which is £1000. Hope this helps Astra & let me know if you have any further questions. My question is bit different from what I read above. We are registered in UK and planning to activate PAN FBA program on Amazon. I want to take advantage of Input VAT on my EU sales via Amazon. Right now my purchases is centralized at UK and the input vat is claimed from my UK sales only. I like to do the same with EU VAT bill as well. Is there a possiblilty? I’m sorry but I won’t be able to help you with such specific VAT questions. You need to consult an accountant to get professional advice. Just started selling on FBA uk and notice in the FBA fees we are being charged tax under the headings of referral fees and FBA fees on each item. Are the tax charges from Amazon due to come back to us? As we are not a VAT registered company. Our listing price says price inclusive of VAT though, is this a mistake on our part? Yes, Amazon charges VAT on fees and if you’re not VAT registered, you can’t claim back that VAT. You also can’t mention that you charge VAT to end customer (like price includes VAT) as you’re NOT VAT registered and you don’t charge VAT to end customers. Does Amazon charge 20% VAT out of this final cost of 100£ plus all the Amazon fees? Or Amazon charge only the fees which includes the VAT already? Or Amazon charge only fees and leaves for the company to calculate the VAT? If Amazon charge the VAT does it pay is to HMRC on behalf of my LTD? Could you please give an examle? Amazon does not pay VAT on your behalf, no BUT if you sign up for Amazon Business scheme, Amazon will calculate VAT amounts for all your sales and even create invoices your customers can download (full VAT invoices). As for the pricing – if you are VAT registered and sell an item on Amazon for £100, it means that the £100 price already includes the VAT part. And if you have signed up for the Business program, VAT registered BUYERS from OTHER EU countries will be able to buy your items VAT free (ex-VAT prices). Amazon charges VAT on fees and issues monthly invoices for these charges. If you can help me with some clarification for my situation. My business is registered in UK and I’m planning to sell across Europe using EFN. Do I need a UK Vat number to do so? I also want to mention that I’m not near the UK threshold because my product is not yet launched. And for example if i distance sell across Europe dose that sells account for UK vat threshold? Yes, in your case I would consult an accountant who specialises in international trade, ideally Amazon businesses too. As I don’t know how exactly EU sales will affect your UK registration requirements etc. So, unfortunately, I can’t help you out as I don’t want to give bad advice I’m not 100% sure about. Thanks a lot for the valuable article really it is the first material I could understand the VAT issue from, really wonderful. I have a little question here, is the income tax in the home land something separate from the VAT? To make my question clearer, I will write my scenario. I live in the Netherlands, and will start my FBA Amazon business from the Netherlands but will sell in Amazon.com USA. 1. I must ask for American VAT because my stock will go to Amazon warehouse in USA. 2. I will pay VAT to the Netherlands in case of my sales exceeded the threshold of VAT minimum in the Netherlands (for example 90.000 Euro ). my question is there also “income tax” to be paid to the Netherlands? or this is all what I have to pay? Income tax has NOTHING to do with VAT. VAT is a totally separate tax with no connection to income tax. There’s no VAT in the US. In the US they have Sales Tax which is a whole different story (complex one). find out how much is that tax via local sources. Hello Andrew. Thank you for laying out the VAT basics so clearly. I ship US products to UK fulfillment centers for Amazon UK customers. The UK sales is under £40k a year. I have been selling there for 3 year. I recently obtained my VAT #. Will I be responsible for paying VAT on past sales, or will it just start from my VAT date? Thank you for your help. Depends on how long you have been doing it but yes – you will have to pay VAT on sales from the day/time you started selling stock from the UK location. Have to register for VAT? YES or NO? Yes, you have to register for VAT because as a business, in the UK, you have reached the VAT registration threshold. We’re a UK Charity and we publish books and sell a magazine. We are tax exempt and have no VAT number. Can we sell on Amazon? Yes, you should be able to sell on Amazon. To be 100% sure, contact Amazon seller support and ask them directly about your status and options to sell on the marketplace. Thanks for the very insightful article. 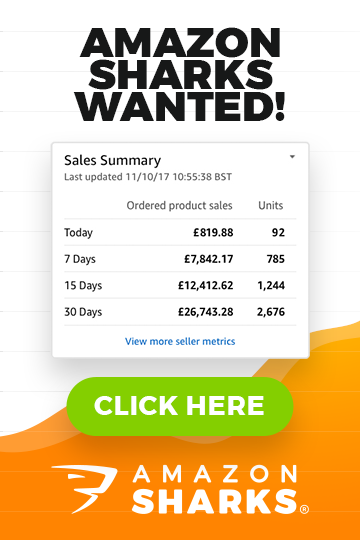 I have been an Amazon FBA seller in the UK for around 1 month – I didn’t register for VAT because I don’t plan to surpass the 85K threshold just yet. However, looking at my transactions report within Amazon, I see that they have been taking the 20% VAT themselves for all of my units sold – Is this a thing? The guy on the phone mentioned that this was because I didn’t provide a VAT number – do I need to voluntarily register in this case so they stop taking my VAT themselves? I am baffled by this to be honest so I just wanted to check with everyone else to see what’s the best solution around this. No, there’s no such a thing. Amazon won’t charge VAT on your behalf. Maybe you’re mixing it up with VAT paid on Amazon fees? According to you that if the seller and stocks both located in USA and Annual turnover is £20k in the last 12 months on Amazon.co.uk, I do not need VAT registration. I am a USA seller and stocks are also in USA and ship from USA. Amazon.co.uk suspended my account for not registration of VAT. You please guide me the suitable way to reinstate of my Amazon.co,uk account. Or if i need to register VAT, whatt will be the total cost? No, if you keep stock in the US, you don’t have to register for VAT in the UK. Unless your items/returns are being stored in the UK, which will trigger the requirement of registering for VAT (as stock is held in the UK). You need to contact Amazon and ask them why did they suspend, I can’t help you with that. Thanks for the article, has helped clear up a few things. I am based in the UK but have been selling via Pan European for a while. I received an e-mail from Amazon last week stating that I needed to be registered for VAT in countries where I hold stock in their FC’s, they are particularly interested in Germany. My issue is that although we do make a few sales each day in Germany I’m not sure it is enough to take on the process, and cost of becoming VAT registered there, I am yet to be registered here in the UK as I have not yet reached the threshold. I had read somewhere that it was possible to change a setting in SC to tell Amazon to hold your stock here in the UK? Sounds to good to be true? Also is there a way of remaining FBA here but selecting FBM for the German marketplace? Yes, you can keep stock in the UK and sell to European websites. And you can do a mixture of FBA and FBM too. I mainly sell on Ebay and I am usually selling around £70k per 12 month period, give or take a few thousand. So i have never had to worry about paying VAT in the UK. But i was thinking of expanding and selling on Amazon as well, I was wondering, If i set up an Amazon account and was to sell £30k per 12 month period, would this combine with my Ebay turnover (£30k + £70k (£100k total)) to push me over the £85k UK VAT threshold, or are they kept separate. Yes, of course – you would combine those two revenue streams. Yes, you have to register for VAT as your sales have gone over VAT registration threshold in the UK. This is despite I don’t hold stock in UK? Yes, because you have reached general UK VAT registration threshold. What a great article – thanks! I have just registered for VAT and have received my VAT registration number. I have now just enrolled on the Amazon VAT invoicing scheme. I have gone with the Standard VAT rate as most of my products attract this rate – however, I have 1 product which is a Zero rated product – how do I make sure Amazon don’t charge me 20% VAT on this? You should contact Amazon ask them directly how this works as I don’t deal with zero-rated products myself. Is there anywhere where we can find out if our goods are vat rated in europe. I sell on amazon uk and my product isn’t rated in the uk but i need to know if this is also the case for the other 4 european countries as my product isn’t a straight forward zero rated item, it’s the way its marketed that makes it so. Hi Andrew, thanks for the superb article. It has been a huge help. I sell in the UK on Amazon, eBay etc and using Amazon FBA am heading towards the UK VAT threshold, but am a little confused and would really appreciate your advice. Please can you clear up the following and advise if this is correct. When a product is sold on Amazon in which stock is held at our business and shipped by ourselves from our store to the customer, the initial money including shipping etc. paid by the customer to Amazon ALL goes towards reaching the VAT threshold. It does not matter how much Amazon charge us in fees for the sale (we do not receive all the money given to Amazon), it is still the initial amount paid by the customer that counts. So for a product £10 + £3 shipping, the whole £13 goes towards reaching the VAT threshold, NOT … £13 – £2 (example. fees) as in practice we would only finally receive £11 in our bank from Amazon). Is this correct? i.e. in hmrc’s eyes, when fulfilling our own orders, does the customer pay us or do they pay Amazon then Amazon pays us? Big difference in income! Second question.. regarding FBA sales, stock is sent to Amazon to store in their warehouses and sell for us. So when the customer buys a product using Amazon Prime, it is actually Amazon that stores and sells it, then Amazon pays us. Does this mean that with FBA sales it is the final money we receive (after fees) from Amazon that counts towards the VAT threshold, or is it the initial payment from the customer to Amazon before FBA fees that counts ? Yes, that is correct. You’re the seller essentially, and every penny end customer pays, goes towards your VAT threshold. Essentially Amazon acts as a payment processor in these transactions. You’re still the seller. No, it works in the same way with FBA items – Amazon is not the seller, you’re the seller. On invoices, your company name is shown. Hi! We are currently using Quickbooks 2016 Premier Desktop and we are finding it falls short in the Multi Currency area, in that it has NOT the capability to create a Tax Agency for French VAT (TVA) in EUROS to be paid from a EURO Bank Account. I would be happy to offer you an extended free trial. Great website, thanks for sharing the information. Have got a question about recovering VAT from Amazon for seller fees. I registered for VAT in UK March 2011. I didn’t give Amazon my VAT no. until Jan 2018. From Jan 20`18 they haven’t been charging me VAT as they are registered in Luxembourg. In March 2018 I asked them to recover all the VAT I had paid on fees since January 2011. Last week they finally sent me a rebate. However I noticed the rebate only covered the period from March 2015 to 1st January 2018, and not from March 2011 to 1st January 2018. I sent them a message asking the reason for this. However they haven’t replied. Do you know what the reason could be that they didn’t recover any VAT from March 2011 to March 2015 on fees. I noticed there’s no VAT invoices for this period either in seller central, just a break down of seller fees without mentioning VAT. Was Amazon not charging VAT on seller fees prior to March 2015? Any info on this, would be great. But I don’t know, you have to deal with Amazon directly to sort this out. Thank you for sharing such a good post Very much appreciated. I have only one more question. Amazon has recently introduced >free automatic VAT invoicing for all your Amazon customers<. In our situation we stock in the UK only and sell in Germany (and UK). Currently we are below German threshold for VAT (we are registered in the UK). On Amazon you can enter VAT numbers for each country you’re registered in so then Amazon system will automatically use this info to issue VAT invoices in countries/situations where you’re registered. So yes, I think you should be fine with using this service in the UK, where you have VAT number registered. All the stock that is sent from the UK, will be applicable with your UK VAT number. Unless a non-UK VAT registered buyer makes a purchase – in which case no VAT is charged on the sale. Thank you very much for your explanation. Very helpful reply. Hello Andrew, thank you for your enlightening article! I’m from Portugal and I recently created my seller account at Amazon Spain. A few days ago, I went to the professional plan and received a notification as they would charge the monthly fee of €47.97 instead of €39.99 because i’m not VAT registered, also they will be in charge of paying the taxes to the state on my behalf. My intention is to import goods from non-EU countries, such as China, and sell using FBA Spain warehouse, according to your article i must register for VAT, but if they will pay the taxes in my behalf, i’m i still obligated to register for VAT? Hmm, this is first time I hear that Amazon says that they will pay taxes on your behalf…. Can you upload the message somewhere online and share link with me? Or if it’s not in English, translate and tell me exactly what it says? But yes, if you’re based in Portugal and will sell in Spain and use FBA in Spain, by law you’re required to register for VAT in Spain. “Regarding your concern about why Amazon has charged you €46.39 instead of 39€, Let me inform you that 39€ is a charge if you have a VAT registration number (which means you can pay your taxes to the state). However, as in the meantime you still do not have a VAT registration number, Amazon will charge you with €47.97. So Amazon will be in charge of paying the taxes to the state on your behalf. I would like to tell also that Amazon only charged you €46.39 instead of €47.97, as you have gained €1.58 from the last period which starts from May 11, 2018 to Oct 4, 2018 (€47.97- €1.58 = €46.39). Thanks for your patience and kind consideration. As i’m just starting on Amazon, this situation would be perfect because i wouldn’t have to register just yet and could see if my FBA business grows or not. Looking forward to hear what you think about this matter. No, sorry – you have misunderstood it – they’re just talking about the monthly fee and VAT they have charged you on that fee. That VAT amount they will forward to government. But for selling actual products, you will need to register for VAT in Spain. Amazon won’t deal with that for you. It really seemed too simple to be true! Thank you for your support on my question and congratulations for such valuable content on your articles! No problem, you’re welcome Patricia. I really enjoyed reading your article. Thanks for taking the time. As a VAT registered UK seller, one area I find very little information for is the breakdown of Amazon’s fees and the VAT treatment for a UK seller. Is it ok to assume that these are all vatable? This is something you will need to ask your accountant – I don’t really get involved in the accounting details theses days – I don’t have time for that and I have realised that you can’t be good at everything (especially accounting) so I leave that to professionals. IF you don’t have an accountant, check out the A2X software (if you use Xero) and see how they map these entries into Xero and how VAT is applied here. Sorry, not much of a help, I know, but I really don’t want to give advice on things I’m not 100% sure about. First of all thanks for that article! Im selling on amazon.co.uk . Do i need VAT registration ? Thanks for the answer ? Are you shipping directly from China to customers in the UK? Like – a drop-shipping scheme from China? In that case no, you don’t have to register for VAT yet. I live in Luxembourg and want to get involved in Amazon FBA using UK warehouse for the beginning . My understanding is that I have to register for VAT no matter what my sales are? and since I need to register for VAT, I have first to register a company in UK, right? the threshold does not catch me? There is no an option to start selling from a EU country like Luxembourg without a company? 1) Yes, correct. As you plan using FBA in the UK, you need to register for VAT in the UK from day one. 2) No, you don’t need a company in the UK to register for VAT in the UK. You can register for UK VAT being a foreign citizen or using a foreign company. thanks for your reply, but can you register for UK VAT as a foreigner and individual (without company)? Really awesome article, and it was just what I was looking for! I’ve recently started selling on Amazon, and I had noticed that the “Fee Preview” amount in the Inventory Screen and the actual fee amount I end up being charged is not that same. I asked Amazon, and they said am charged VAT on FBA fees, commission, etc. on top of the “Fee Preview” amount – is that right? Shouldn’t the “Fee Preview” amount already include VAT? Subsequently they have said I can remove the VAT charges by being VAT registered, but I’m pretty sure I don’t need to since I’m way under threshold (especially after confirming your article above). However, I would love to have them start charging extra VAT on top of the “Fee Preview” amount…. Yes, that is correct – for some weird reason Amazon shows there costs without VAT added, assuming that everyone is VAT registered (which is not the case). I don’t really understand why they couldn’t show VAT inclusive prices for sellers who are not VAT registered (Amazon obviously knows this from your account info, so it would be super easy to integrate). No, you don’t want to register for VAT IF you don’t have to. Yes, you would not pay VAT on those fees BUT you will have to charge VAT on your product’s end prices, which will put you in a worse position financially than you currently are. Thank you for another great article Andrew. I currently have a brand registered in the UK, which is selling well independently under my own LTD company. However, I wish to expand the operation to Europe, but with a business partner. 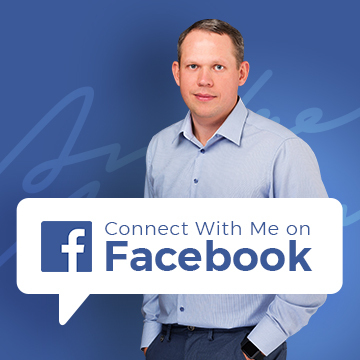 Do you know if it would be possible for me to have 2 Seller Central accounts… selling our same trademarked brand, but under a different limited company with a new business partner. E.g. “Phoenix Kitchens” – trademarked brand and register UK under John Smith Trading LTD remains me, exclusively as the soul director. We sell “Phoenix Kitchens” brand in the rest of Europe, but under John Smith Europe Trading LTD – where we have myself and my business partner as the directors. I am just wondering 1. If Amazon will allow me to have 2 seller central accounts, and 2. whether it will be possible to sell the UK brand under a separate join entity in Europe, and possibly beyond. I don’t think Amazon will allow that, no. Maybe I’m wrong though. Contact Amazon Seller support and ask them directly about this. I will discuss with seller support – I was hoping that as it is a different market place it would not be an issue. Perhaps I could sell the same product, under a different brand? You should discuss this with Amazon support and go with what they officially advise you. Otherwise you may end up like thousands of other sellers who get suspended because of breaching T&Cs, without even realising they have done something wrong by opening multiple accounts. This is a great guide, very helpful so thank you very much for that. Could I pose another scenario which is where we may find ourselves in the next 6 months? Turnover: £90k in the last 12 months…however £80k is from UK sales, the extra £10k is made up of sales from various other countries around the world. Do we have to register for VAT in the UK as our UK sales are under the VAT threshold? Yes, as far as I know, you have to register for VAT in the UK (your home country) as that’s where your business is registered AND your business has made sales exceeding £85k. So you have to register for VAT. Thank you for writing this article, it’s great. I run a small business, selling on my website, Amazon and Etsy. I am based in the UK, along with my stock. I sell to customers all over the world but mainly to the UK. At the moment my turnover (for all 3 selling sites) is around £80K, so still below the UK VAT threshold. At the moment I make sure that I stay under this threshold as I don’t want to become VAT registered. My question is, if I could work out how much I sell to UK only could I increase my overall turnover over the £85K but make sure my turnover to UK is below £85K? No, you can’t do that. Your overall turnover is what counts here so if/when your sales go above £85k, you have to register for VAT (you can ask for temporary exemption though if you feel that it was just a one off time, when your sales exceeded that £85k threshold). If you do go and register for VAT, consider FLAT VAT rate scheme too, which usually means paying less in VAT compared to normal VAT rate. Amazon seller based in Uk as sole trader. Selling goods on amazon USA , goods stored in USA. Turnover zero as I have just started . I’m being charged Vat on all amazon fees even though I’m not Vat registered . Is there anyway I can get out of paying this Vat on fees? Yes, VAT will be charged on fees because you’re NOT VAT registered. Thank you very much once again for the fantastic article. I am currently selling just one product on Amazon UK right now, considering expanding to European and US markets. Amazon have offered me free VAT registration and enrolment for EU states as a promotion you may have seen, which on the face of it looks quite appealing. I’m still weighing up the pro’s and con’s….considering whether I would be better of prehaps adding a new product to sell in Amazon UK or to expand into these other market places with the one product itself. Just wondered what your thoughts and stratergy might be – whether you feel it would be best to focus energies on one product internationally, or look to increase a range in one market place? I really can’t answer that question for you, sorry… It’s a huge dilemma, I know, but it’s something only you can decide. Personally, I would stick with Amazon UK, Amazon US for now and expand product line as the whole EU VAT thing can quickly get very confusing, expensive and complicated. Thank you so much for the detailed article and sharing useful information. I am about to sell in Amazon USA. Amazon is charging 20% vat for monthly subscription and fba fees, as I am not vat registered. I am just starting and my turnover won’t be £85,000 in this year. Do I need to register for vat to claim the money back from amazon? If so, what are the pros and cons? Can you please guide in this? Thanks. Will you be selling only on Amazon US or Amazon UK too? I assume you will be using FBA. If you will sell only on Amazon US (to the US), it would be beneficial to register for VAT as you can then avoid paying VAT on fees BUT you won’t have to charge VAT on end sales as you will be exporting goods outside the EU. But if you also plan to sell on Amazon UK or Europe, don’t register for VAT until you reach the threshold as it will simply mean you’re making less profit compared to non-VAT registered situation. This is Gauhar from India. Your old customer of ebay course . i applied on hmrc website for vat registration as an indian seller . They send me 2 form to fill out , but i am facing some difficulty in filling them . No one is repling at there giving phone nos . Where i can get help to fill these forms. If you can’t do it on your own, find someone who can help you with it (accountant or tax advisor). Also, you can try using VAT Live Chat on HMRC website – I have used it couple of times and found it very helpful. One question I have though. I have been told that there are some sellers on Amazon selling mobile phone handsets who are using Amazon fulfilment. Under normal circumstances if a VAT registered company in the UK is selling to a non VAT registered consumer in say France, then the company would still have to account for the output VAT on the sale. However, some people say that by using FBA they are effectively selling to Amazon and can therefore avoid having to pay the VAT because Amazon themselves are VAT registered? I believe this happens in situations when Amazon acts as a buyer to export item outside of the UK. It’s not sellers fault nor do they breach any laws with this as they’re indeed selling the item to Amazon which then re-sells to end consumer. First and foremost, I really wanted to thank you for this post. It’s great help! One more question about the example below: In this example, where should VAT be paid and claimed back? I guess you have to pay £11.5K (£50K x 0.23) – the VAT already paid when sourcing those goods for Portugal, but for the remaining £100K I’m unclear if those should be paid where your company is registered (Slovakia), or where the goods are stored (UK). I don’t really know all the ins and outs as I let my accountant deal with all of that. Thank you for this informative article. 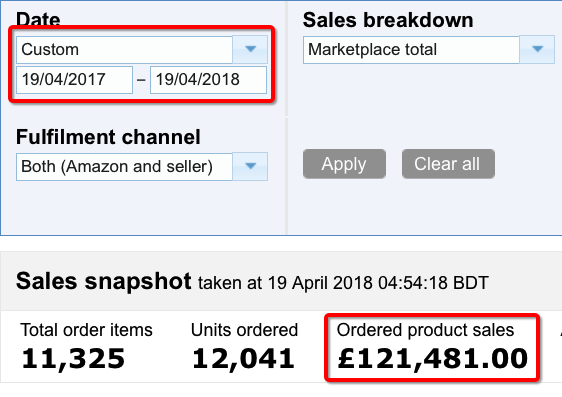 Please could you advise how you generate the report in Amazon Seller Central which shows the Sales Snapshot for the last 12 months? In DATE section select CUSTOM and choose the period you want to see/cover. Really great article I have to say, will check out further posts from you. Lots of people out there giving advice on FBA, but few that manage to get precise, straight forward guidance especially on more complex topics like taxes. I’m running a mid-sized business in retail currently (>10m rev), so I’m quite familiar with VAT and it’s accounting at that scale – and yes it is quite complex and can be confusing. I’m now thinking to set up a small FBA business with my brother (small for the start ;)), so am trying to get my head around the basic commercials. I have one specific question in regards to VAT after reading your article, maybe you know that one: Assuming that we don’t register for VAT initially and we import goods from China to the UK (to store at an AMZ UK warehouse), how do we need to account for import VAT? Depending on the goods, import duties will be due for sure I take since we’re importing goods for resale, but what about import VAT as a non VAT-registered business? Will we simply pay it and then just won’t be able to reclaim it (since we’re not paying output VAT/ not filing a return in the first place) or will we not have to pay import VAT at all (just duty)? Of course this would have significant impact on our cost of goods, so drive pricing decision. As a non-VAT registered business, you will simply pay VAT on imports and not claim it back, yes. It’s basically just an expense in a set-up like this, just like the import duty or shipping fees to the UK. Which Amazon VAT Services are not available for sellers on the flat VAT rate scheme please? As far I know the VAT returns service is not available for flat rate scheme payers (but then again you may not need it anyways). And there was something else which I have forgotten right now. I have just resisted on Amazon FBA UK , However Amazon haven’t asked me for any VAT number. Knowing that I am a non UK and residing out of the UK. generally, my question is that if I am not a vat registered my goods will be deliverd to to amazon warehouse or will be stocked in borders waiting for my vat registration ? IF you plan on sending goods to Amazon FBA in the UK, you should register for VAT before you do that. Amazon did not ask you for VAT number at account registration stage because you CAN sell on Amazon UK without a VAT number IF you don’t use FBA in the UK. But as you will be using FBA in the UK, you will need that VAT from day one of trading. Thanks for the post on VAT. I really enjoyed reading your blog. I am an Amazon seller in the US and am interested in expanding to Amazon Europe. Most of our stocks are in the US but we also have a supplier in Denmark. If we have the Danish supplier drop ship their products from Denmark to customers in Europe, do we have to register for VAT in Denmark? Technically the inventory were not ours. The Danish company owns the inventory. If those inventory count as ours, but we avoid selling in Denmark, (for example cancel orders from Denmark) do we still have to register for Danish VAT? I’m sorry but I don’t know the answer to this one – I have never done dropshipping and have no idea on how VAT works in your situation. Try asking for advice on business forums. Hi Andrew. Thank you for your article. I think I am still a little bit confused. If let’s say the final price a customer pays for your product on Amazon is 20 gbp it means that you can only sell 85000/20=>> 4250 items without paying VAT? If you sell more than that you need to register for VAT and start adding 20% to each product you sell? Thank you again for your help! Yes, that is correct. At £20 a unit, it would take 4250 sales PER YEAR to reach VAT threshold. And you can add VAT to your price OR include VAT in the current price OR do something in between – that’s entirely up to you. So for example – if you increase the price by VAT amount, the new price will be £24 (£20 x 1.2). If you incorporate VAT into your existing price, it stays same at £20 (obviously you make less profit this way). Do you know anything please about UK based selling in USA with goods from China being sold in USA. Thanks, Roger. Hope you are doing well, i am a mother of two want to start amazon selling account in the USA i read every top of this site which are very very useful i really appreciate your effort, could you please tell us more about USA vat or tax rules and where can we apply? I’ve just discovered your website which is something of a goldmine it seems. Such great, concise info. I think I have a grip on the bigger stuff like all the thresholds and country-specific VAT, but do you have any pointers towards more basic business stuff? I’m a fairly successful ebay seller, usually buying and selling used goods just as a hobby at the moment. None of this currently triggers HMRC declaration rules from what I can see as profits are only in the hundreds of pounds. However I’m thinking about sticking my toes into the water more formally, but struggling to get my head around really basic stuff, and whether operating as a business would just in fact wipe out my margins when scaled. I really don’t know how VAT will work for you with used items, bought from individuals etc. – this is something you will need to research as I have no experience with that set-up. One thing that I wanted to clarify though – in second scenario you say you get to keep £85 after FBA/Amazon fees. How did you calculate that? So make sure you fully understand how Amazon fees work. That was a rough calc of the ref fee plus est £3 fba based on amazon’s example of a toaster. Am I missing something? I see what you’re saying about used goods, it seems there’s a margin calculation to go through from what I can see on hmrc. Thank you for the detailed article. I am still not clear on something, though. What if I have my goods in UK warehouse and I am VAT reg in the UK, but also selling on Amazon DE and Amazon Spain, let’s say. Let’s say I am delivering all my stock in UK only. Will amazon distribute it themselves in Germany and Spain and made me register for VAT in these countries? No, you won’t have to register for VAT in Germany and Spain IF your goods are held in the UK. You would only need to register for VAT in those countries WHEN your sales to those countries reach distance selling threshold. Amazon won’t “automatically” distribute your goods from the UK to other European countries, no. They will only do this IF/WHEN you ask them to do it by signing up to one of the European FBA plans (like Pan European FBA etc.) But by default, when you send stock to Amazon UK, it will only stay in the UK. I’ve bookmarked it, so I can come back and try some of the new tips thanks Andrew to keep inspiring us! Keep posting. I am on Ebay UK and US while my shop is selling to the UK. For my shop I use a UK supplier as that works great for me. I live in Denmark and by Danish laws I can’t register for vat as no stock is imported or exported/sold to Denmark! I do pay vat at my UK supplier for any orders I get. I don’t know exactly how this works with dropshipping, as I have never done it myself. But theoretically, as your stock is in the UK, you probably need to register for VAT in the UK. But I’m not 100% sure on this one and you will have to seek professional’s advice on this. Great article, very well written to explain such a confusing topic. I have wrote a few myself, being an Amazon seller and making some software to help the situation. One thing I can’t get my head around, is the “Intra-Community Supplies” report, which some EU countries want when filing. I get the simple B2B transactions aspect of it, but what about the Cross Border Stock movements between Amazon warehouses? Can you shine some light on that? Where can I find this info on Amazon Seller Central. Unfortunately I haven’t used Pan European FBA yet so don’t know what reports on this aspect they provide. You should contact Amazon and ask them more information on this. Maybe you can look into these for future articles!? I have reached out to Amazon, who now direct you towards Avalara as the expert. Having moved on from KPMG. Bit of a chicken and egg situation, because you wait in line to get VAT numbers for the PAN-EU countries so you can unlock the Amazon VAT Services report. However Avalara are very slow, and don’t seem to want your business. Yeah, it is very complex situation indeed – NOT something you can do without a help of professional accountant. Luckily for me, I have someone who basically works on my books full time, for many years now and they take care of everything for me. Thank You as always, so informative, so concise and helpful. Best Mentor as always!! Thanks for your comment and sharing your experience with the flat rate VAT scheme. Yes, for small time sellers this can be beneficial. I did not go into too much detail about flat rate VAT as this article was about something else. Plus the flat rate VAT scheme is only applicable for companies with turnover of less than £150k per year, which for Amazon sellers is not that high of a number. But it can still be a good option for someone who goes over the £85k threshold but has no plans on building a bigger business than £150k a year.